Cooking Gin-no-Mikazuki well is really about getting the amount of water right. Don’t be discouraged if your rice turns out to be too soft or too hard the first time round. 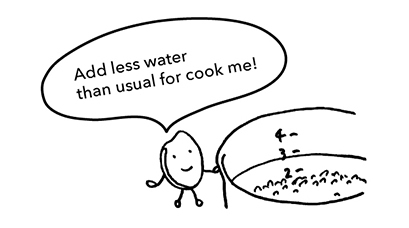 You might need to adjust the amount of water the next time you cook, so that after a couple more attempts you know what the right amount of water is for your taste. ・ Cook the rice right after washing it (you don’t need to soak the rice in water). ・ Try adding a little less water than you usually do. Consider our rice to spruce up your packed lunches and onigiri! Gin-no-Mikazuki is good even after it has cooled down—a feature you have probably heard of because there are many rice types being developed with this feature. Let a serving of Gin-no-Mikazuki cool down after being cooked, and you will see how amazing this rice really is by seeing how shiny and chewy it still is. Consider boosting your vitality by using Gin-no-Mikazuki in your packed lunches and onigiri rice balls! 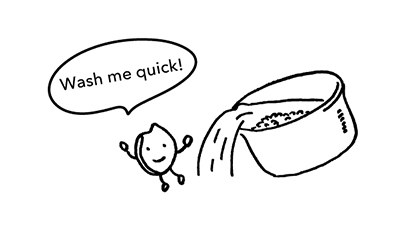 The first tub of water you use to wash the rice should be replaced very quickly. You can then do up to two more rounds of quick washing. For every 3 cups of rice, add about 2.8 cups of water. That’s a little less than usual. Start cooking the rice immediately after washing it (no need to let it soak in water). 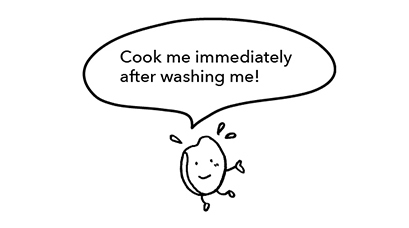 However, we recommend soaking the rice in water for 30 minutes if you are using a gas rice cooker.